Common in rural areas without centralized sewer systems, septic systems are underground wastewater treatment structures that use a combination of nature and time-tested technology to treat wastewater from household plumbing produced by bathrooms, kitchen drains, dishwasher and laundry. It is the end point of your home’s plumbing system like your furnace is for your heat and AC! Saves you $ – A few hundred dollars every 3-5 years for maintenance or ranging $8k – $25k to replace. Protects your property value – Homes with failing septics could be more difficult to sell. Protects your and your neighbors’ well water – A failing septic can contaminate well water; test your well water quality (untreated to your tap). Protects your and your neighbors’ health – A failing septic can bring wastewater above the surface, creating a health hazard for you, your neighbors and animals, and pollute our creeks and rivers with sewage. 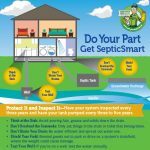 For a quick and easy guide on how to care for your septic system, check out this Get SepticSmart graphic. For more information, visit the U.S. Environmental Protection Agency website at https://www.epa.gov/septic.